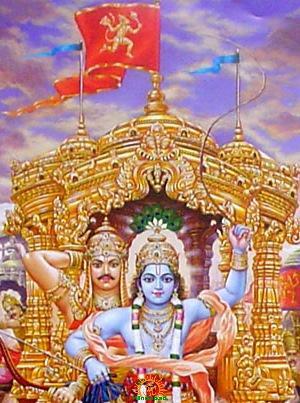 It is very well known that Arjuna had ape bannered chariot (Kapi dhwaja). Lord Hanuman sat on the flag post of the Arjuna in the Kurukshetra war. It has been referred in the Mahabharata many times. The flags of other warriors are not famous. The description of the Pandava and Kaurava banners has been scattered through several Parva's of Mahabharata. The banners of the five Pandavas and their sons is given in Chapter 23 of the Drona Parva. On Yudhisthira's flag is a golden moon. The standard of Yudhishthira of great energy, bearing the device of a golden moon with planets around it, looked very beautiful. On Bhima's is a silver lion. And Bhimasena's standard, bearing the device of a gigantic lion in silver with its eyes made of lapis lazuli, looked exceedingly resplendent. On Nakula's is a golden Sarabha. For terrifying the foe, we beheld that tall and fierce standard of Nakula, placed on his car bearing the device of a Sarabha with its back made of gold. On Sahadeva's is a swan. A beautiful silver swan with bells and banner terrible to look at and enhancing the grief of the foe, was seen on Sahadeva's standard. On the Upa-Pandava's banners are Dharma, Maruta, Indra and Ashvin Kumara. The standards of the five sons of Draupadi bore on them the excellent images of Dharma, Marut, Sakra, and the twin Aswins. On Abhimanyu's is a peacock. On the car, O king, of the youthful Abhimanyu was an excellent standard that bore a golden peacock, which was bright as heated gold. On Ghatotkacha's standard, O king, a vulture shone brightly, and his steeds also were capable of going everywhere at will, like those of Ravana in days of yore. Note: If I find any references to the banners of the other warriors in the Pandava camp I'll update my answer. Now for the Kauravas. I found references to the banners of the Kaurava warriors in Chapter 17 of the Bhishma Parva and Chapter 101 of the Drona Parva. On Bhishma's banner is a palm tree with 5 stars. And with his large palmyra-standard decked with five stars, Bhishma, the generalissimo of the Kuru army, 1 looked like the resplendent Sun himself. On Drona's banner is a sacred altar with a kamandalu on it. The standard of Drona, the foremost of preceptors, bore the device of a golden altar decked with a water-pot and the figure of a bow. On Kripacharya's banner is a bull. The preceptor of the Pandavas, that Brahmana, given to ascetic penances, viz., Kripa the son of Gotama, had for his mark an excellent bovine bull. That high-souled one, O king, with that bovine bull, looked as resplendent, as the Destroyer of the three cities looks resplendent with his bull. On Ashvatthama's banner is a lion's tail. Similarly, the lion-tail standard-top of Drona's son, O Bharata, we saw, was endued with the effulgence of the rising sun Decked with gold, floating in the breeze, possessed of the splendour of the rainbow, the standard mark of Drona's son appeared on high, inspiring the foremost of Kuru warriors with joy. On Karna's banner is an elephant rope. The standard of Adhiratha's son bore the mark of an elephant-rope made of gold. It seemed, O king, in battle to fill the whole welkin. The banner, adorned with gold and garlands, attached to the standard of Karna in battle, shaken by the wind, seemed to dance upon his car. On Duryodhana's banner is an elephant decorated with jewels. On the standard decked with gold, of king Duryodhana, was an elephant adorned with gems. Tinkling with the sound of a hundred bells, O king, that standard stood upon the excellent car of that hero. And, O king, thy son, that bull among the Kurus, looked resplendent, O monarch, with that tall standard in battle. On Jayadratha's banner is a silver boar. A silver boar adorned the standard-top of the ruler of the Sindhus. Decked with golden chains, it was of the splendour of a white crystal. 1 With that silver mark on his barrier, the ruler of the Sindhus looked as resplendent, as Surya in days of yore in the battle between the celestials and the Asuras. On Salya (of Madra) banner is a goddess. Salya, the ruler of the Madras, we saw, had on his standard-top an image like the presiding goddess of corn, endued with beauty and producing every seed. On Vrishasena's banner is a peacock and a plough. Vrishasena has a peacock made of gold and adorned with jewels and gems. And it stood on his standard, as if in the act of crowing, and always adorned the wan of the army. With that peacock, the car of the high-souled Vrishasena shone, like the car, O king, of Skanda (the celestial generalissimo) shining 'with his peacock unrivalled and beautiful ploughshare made of gold and looking like flame of fire. On Bhurishrava's banner is a sacrificial stake. The standard of Somadatta's son, devoted to sacrifices, bore the sign of the sacrificial stake. It was seen to shine like the sun or the moon. That sacrificial stake made of gold, O king of Somadatta's son, looked resplendent like the tall stake erected in the foremost of sacrifices called the Rajasuya. Bharadwaja's son, however, O monarch, surpassed all the warriors in splendour. His standard, with a black deer-skin waving on its top and the beautiful water-pot, O monarch, that it bore, looked exceedingly beautiful. And Bhimasena's standard, bearing the device of a gigantic lion in silver with its eyes made of lapis lazuli, looked exceedingly resplendent. The standard of Yudhishthira of great energy, bearing the device of a golden moon with planets around it, looked very beautiful. Two large and beautiful kettle-drums, called Nanda and Upananda, were tied to it. Played upon by machinery, these produced excellent music that enhanced the delight of all who heard it. For terrifying the foe, we beheld that tall and fierce standard of Nakula, placed on his car bearing the device of a Sarabha with its back made of gold. A beautiful silver swan with bells and banner terrible to look at and enhancing the grief of the foe, was seen on Sahadeva's standard. The standards of the five sons of Draupadi bore on them the excellent images of Dharma, Marut, Sakra, and the twin Aswins. On the car, O king, of the youthful Abhimanyu was an excellent standard that bore a golden peacock, which was bright as heated gold. On Ghatotkacha's standard, O king, a vulture shone brightly, and his steeds also were capable of going everywhere at will, like those of Ravana in days of yore. And with his large palmyra-standard decked with five stars, Bhishma, the generalissimo of the Kuru army, 1 looked like the resplendent Sun himself.... And Aswatthaman, of the complexion of the lotus, went out ready for every emergency, stationing himself at the very head of all the divisions, with his standard bearing the device of the lion's tail.... The standard of Drona, the foremost of preceptors, bore the device of a golden altar decked with a water-pot and the figure of a bow. The standard of Duryodhana guiding many hundreds and thousands of divisions bore the device of an elephant worked in gems.... On a costly car with his standard bearing the device of a bull, and guiding the very van (of his division), the ruler of the Magadhas marched against the foe.... Stationing himself in the van of his division with his beautiful standard of silver bearing the device of the boar, the famous Jayadratha looked highly resplendent. That chastiser of foes, viz., prince Vrihadvala, bearing on his standard the device of the lion, proceeded against Subhadra's son whose standard bore the device of the Karnikara flower. Behold also the standard of the high-souled Karna, bearing the device of the elephant's rope, and looking like the bow of Indra himself that divides the firmament by a clear line. By the way, for those less familiar with archaic English, "device" isn't being used in the sense of "electronic device", but in the sense of "an emblematic or heraldic design". Not the answer you're looking for? Browse other questions tagged mythology mahabharata arjuna pandavas war .